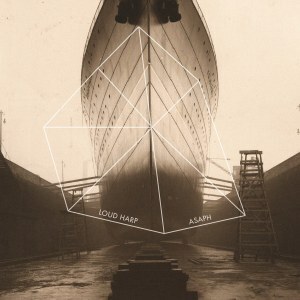 One of the best releases so far this year is Asaph, a beautiful album from American indie band Loud Harp (read my review here). The record contains songs based on psalms, mixed together with personal reflections. I recently caught up with the two musicians who make up Loud Harp, Asher Seevinck and Dave Wilton, to talk about the new album, who Asaph is, and much more. SAM: Asher, you’re part of Seafinch, and Dave, A Boy and His Kite. Can you share briefly how you got together as Loud Harp? ASHER: Seafinch is a band that I had been doing for a little while, and Dave produced the first Seafinch record as an EP. So we had known each other before that, just as friends. I lived in Colorado for a little while and we got to know each other then. Then as I was leaving we started working on the Seafinch EP and he produced it. Then a little while into me moving away from Colorado I was starting to want to work on some more Seafinch stuff and I was hitting a bit of a writing wall. I was in a bit of a funny season at the time anyway, just a hard season. So I called Dave to see if I could come out to Colorado and write with him. When I got out there the Loud Harp record is what we ended up writing. So it was pretty different to the Seafinch stuff – obviously it’s way more worshipful, way more prayer-like. That was the season both of us was in, so that’s what came out. We decided, maybe we should record this stuff, even if it’s just for us to remember the weekend. SAM: And you’re from different states now, is that right? SAM: So considering the distance, did that make it hard to work on this new album? DAVE: Because we’re a band that was unexpected it’s such a blessing just because we’re friends first and foremost, we just believe in each other, and are thankful for our friendship. It has been hard to navigate how to be a band. We do live eight, nine hours apart via car trip. So with the new record, we always feel whenever we’re together we’re just excited to be together and we’re always ready to worship God and offer our music when we’re together. So there’s always that excitement. In fact we wrote the new record in three days, together. But what takes so long is the working out of all the parts and recording. Praying through and taking the time required to make an album that we feel really excited about, and captures the full scope of what God’s put on our hearts. So that does take a lot of time. SAM: Does it also take a while considering you have your own bands, as well? DAVE: Yeah. My own music and Asher’s music, we don’t play a whole lot. We don’t do that many shows. But it took a considerable amount more time because I produce and record other people for a living. So I run a recording studio besides having my own music. So yeah, I was always in the middle of other projects, and to try and find time to work on my and Asher’s stuff turned harder for me than I originally expected. SAM: This new album Asaph is incredible. How long did it take to make the record? DAVE: We started recording in June. SAM: That sounds like a nice dog. ASHER: Yeah the studio Dave works at, there’s some folks that live there and they have this dog who’s a great studio dog but every once in a while he does that. DAVE: [Returns and laughs] He’s so funny! SAM: Does this dog come in and step on delay pedals, or anything like that? DAVE: He’s a great studio dog. His name’s Royer, he’s named after a ribbon microphone. And most of the time he’s super chill, but sometimes he’s a little dependent on his mom. So when she leaves he goes into howl mode for a little bit. ASHER: Yeah we then did the Kickstarter in June to July. Dave and I both had a couple of international trips, separately. I probably took another four or five trips over the last six, seven months to re-do some stuff, and then Dave’s been working on it the entire time, when he has time in-between other projects. So that’s why it takes so long. He’s got other stuff he’s doing. And because Loud Harp probably pays him the worst out of all of his other projects, it gets pushed to the back of the line which is fair. DAVE: Also I care about this project on a level that – it’s me and Asher’s. It’s our very honest hearts of worship. So I obsess over it on a level that only an artist can obsess about their own art. So that’s why it took a good healthy ten months to make the record. It’s like a child! ASHER: Yeah we were thinking we could knock it out in a month. [Laughs] That’s what we had said! And then to our Kickstarter backers, we did the thing in June and we said that we would release it in October. So we gave ourselves a few months. But we thought we could do it pretty quick and then it just took much longer than we expected – which we should have known. SAM: What was it like making an album through Kickstarter? ASHER: Amazing. I tell people all the time, when people ask me this question… We were told going into it ‘Get ready for the worst thirty days of your life.’ And so that’s what we were prepping for. Some of my friends were telling me ‘You’re going to have to email every single one of your Mom’s friends to have them donate to Kickstarter.’ And we got into it and we decided for several reasons, for 21 days instead of 30 days. So we gave ourselves less time and we had some people telling us we were crazy to be doing that. We just both felt peace about it. So we went for it and two weeks in we had already reached our goal. It wasn’t the type of thing where we were emailing our moms’ friends. So instead of it being the worst experience, it was one of the most validating experiences for us. We felt: ‘There are people out there that we don’t even know, not even our friends, that are so blessed by our previous record and are willing to support us. They want more.’ That was so validating. It was a great experience. SAM: This new album Asaph, the songs on the record are numbered. I assume that’s to reflect the particular psalms that they’re based around? DAVE: Yeah. The main inspiration behind the record is the psalms of Asaph. And we definitely pulled from a few other psalms that had been inspiring us in the same season. Psalm 27 is a psalm of David. Psalm 1:44. But there were also some spontaneous songs that we had stumbled upon while touring, and leading people in worship, and some of those songs came from different parts of Scripture. (77) I’m Yours ties into Psalm 77 for sure, but the majority of it Asher wrote from Romans 8. Similar with (05) Beautiful Son comes from Revelation 5 and the rest of it besides those two songs are inspired by the psalms of Asaph or psalms of David. SAM: I found it really refreshing that – there are some bands out there that do the psalms verbatim – but it seems as though you incorporate the psalm with a bit of reflection as well. ASHER: Yeah. I think for us – we have written projects before where it’s word-for-word stuff. But we feel pretty strongly about making things our own, y’know? I don’t feel like we’re changing the intention of what the psalms were. We’re just bringing them in and making them our prayers. So yeah. I think you’ll notice with both our last record and this record, there’s a fair amount of repetition. Part of that is when we sing: ‘You’re good. You’re so good. Your love never runs out,’ and we sing that over and over. I feel like when I do that myself, it gets in my spirit. If it’s something I’m struggling with, like ‘God, I don’t know if you’re good right now,’ then I say that [line] a hundred times, and I start believing what I’m saying. It starts actually getting in my spirit. That’s part of the reason why we write the way that I write. SAM: What is it about the psalms that you love? ASHER: Oh man. I just love that they’re honest. They’re real. I don’t feel like David or Asaph were pretending that they were in a place that they weren’t. I think that’s something that we do in the church. Not necessarily with music, I think a lot of music is very honest, but that’s the thing I love about the psalms. I love actually seeing somebody’s heart laid bare. I was talking to a friend the other day. He was asking me about the new St Vincent record. This has nothing to do with her lyrics, but I listened to the music and I feel like I’m listening to a robot. I just can’t connect to that. I just want emotion. I want something real. I want somebody laid bare. That’s part of our intention with everything we do with Loud Harp, that both lyrically and musically, that it’s just real. It’s raw emotion. SAM: Dave, what is it about the psalms that you love? DAVE: Everything that Asher said. And just to coattail on that. There’s something deeply inspiring to me, and encouraging to me, that I can read a man or woman’s words from that long ago and not knowing them, know their heart and their relationship with God. It’s as if I’m transported into somebody’s relationship with God and invited into that. That inspires me too. When I see that connection and as a musician I think of a lot of things and emotion and sound, and each psalmist has a particular sound and feeling. That inspires me. I want people to put on our record and know that my and Asher’s heart for God – this is what it sounds like. There’s no filter. We’ve laid it all out there and that’s the reason why God directed us to write from the psalms, because he knows how predominantly he speaks to us, and he speaks to me. I really want people to take part in that story. SAM: I want to ask you about a few tracks on the record. The first is (27) Take Heart, and it’s got some very cool ’80s synth vibes. What can you tell me about that song in particular? DAVE: Well, I think we didn’t have anything planned when we got together to write this music. But in the studio we had instruments laid out and we’d pray, and then be like, ‘let’s write from this psalm.’ With that particular psalm, I might have joked but we got out a Juno and just started playing those chords, and Asher started singing. It felt very natural. And we weren’t trying to go for an ’80s synth sound but I definitely reached for the Juno because there’s some dreamy emotion that comes from that keyboard that – I mean you hear it and immediately you’re in some awesome ’80s music video or some good movie that’s drawing a lot of emotion. ASHER: Yeah. That’s an interesting one. It was probably halfway through the writing process. I think we had already written (73) and (77), and maybe one of the ones we did out of 50. I’d sent the really rough versions of what we had done to our friend Joel Davis, who’s the lead singer of Ascend the Hill. And he wrote me back, and he just had felt like there’s something about God’s goodness in the stuff that we were singing. So he said that when he thinks about Loud Harp he thinks about Psalm 27. He just quoted a part of it. So we went and read it and I said ‘Let’s just sing this over what you’re writing,’ – it was at the same time. And then as I’m reading through Psalm 27 – I had a friend at the time that was battling cancer and ended up losing that battle. He was an amazing dude. So in the midst of that, we’re singing this song about taking heart, and just seeing God’s goodness. So that one for me is a really special one, because the things we were thinking about as we were writing that one… that one was really raw. Even now when I listen to it I still feel really raw. SAM: Another standout track to me is (73) The Nearness of You. How did that song come together? DAVE: That was the first song. ASHER: Yeah. First song that we wrote. Same thing, Dave kinda pulled out the Juno and put together a rhythmic thing – that’s how the song starts. And then that lyric – ‘The nearness of you is my only good’ – when we were on tour last February in the North-West we were reading all these psalms, and we were reading Psalm 73 right before we were going to lead worship somewhere, and that lyric just really caught me. So I started singing that when we were leading worship one of those nights. I thought, this is it. More than anything that lyric defines the record. And when we were actually recording it, we were referencing with the drummer a lot of the new National Record, because Trouble Will Find Me had just come out, and at the same time I had been listening to This Will Destroy You which is atmospheric, huge, post-rock. And so the ending of that song, it goes from this tighter, intentional drumming. The end of it opens up and just kinda goes. SAM: I’m keen to learn more about Asaph, he’s a psalmist and you’ve named this record after him. I assume that you’ve looked into who he is, what did you discover about him? One of the lyrics stands out to me on the record is from (50) The Fire and the Flood. The end of it: ‘Remind us that you’re God. Remind us that you’re good.’ This idea that God can be both powerful and we can fear him, and yet he’s good and we can have intimacy with him. Those two things don’t have to be at odds with one another. That’s the thing we took away from Asaph and his heart of worship is that we could see he didn’t have to choral with God. It was a lot about obedience and a lot about trusting in God, desiring to be near God. So we learned a great deal and I think we’re still learning a great deal. SAM: And what was it about Asaph’s psalms in particular that stood out to you? ASHER: Y’know, I don’t know if it was necessarily the psalms that came first. It was the same weekend – I was in Utah – sitting under a teacher that was talking about Asaph. She was talking about him and one of the meanings of his name is ‘He that gathered, lifted burdens, removed reproach.’ And she talks about as worship leaders that one of our roles is to really gather God’s people. And then basically, help provide a place for them. Get rid of their burdens, and not think about their sin, but actually come to God. She was talking about that and on the same weekend Dave was listening to Ray Hughes speaking about Asaph. And we called each other and I was saying ‘Dude, I was hearing this thing…’ and Dave is telling me ‘I heard this thing!’ We were both hearing about Asaph at the same time. So we thought we should explore this Asaph guy. That’s how it happened. I don’t think it was the psalms first, we’d just been hearing about this guy. SAM: And the press release for Asaph says that this is a step up from your debut, you’re now ‘ascending the hill of the Lord’. For me, that refers to the psalms of ascent. Why make the change from being ‘in the pit’ as you write, to ascending this hill? ASHER: I feel like in that first record – and people may not catch it – but when we wrote that first record, I felt like I was in the pit. I was struggling so bad to even trust The Lord for things. So those things that we repeat: ‘You’re good, you’re so good, your love never runs out.’ When I’m saying that, I feel like I’m saying that from the pit. At one point on our first record we sing ‘You found me,’ and that song ends ‘You’re a good father, this is a good home. I’m right in the palm of your hands and I’m not letting go.’ And then we sing, ‘You found me and you pulled me out.’ To me that’s the point on that record where we came out of this place where we were, into something new. I feel like this new record there are a lot of similarities lyrically, but my viewpoint and the place I’m singing from, I feel like I’m in such a different place. I was telling Dave a few months back – it was actually right before we started writing this record – my circumstances that I wrote the first record in were way better for a long time. Then the same thing that was happening happened again right before we started writing it. I told Dave: ‘This is the weirdest thing for me. I feel like I have victory over this other thing and now the circumstances are the same. But in my spirit I totally have victory over this thing. My spirit isn’t in the same place, I’m no longer thinking the things I was thinking then. I have a different trust in The Lord now.’ So writing these songs, my mind is in a different place than it was at that time… If that makes sense. SAM: Yeah, and praise God for that. There’s a few instances on this record where there are two songs based on the same psalm. Can you explain to me how that works? DAVE: For all the double ones there was just so much rich content that we wrote one, and we were still thinking through and praying through the psalm, and then a new melody or new idea came. And it required two different approaches. That’s what happened with (50). The other ones musically there was just something to express. With (73) The Nearness of You is so full and so complete and yet one of my favourite parts to that whole psalm is ‘My heart, my flesh may fail. You’re my strength and my portion forever.’ We wanted to experiment to see what it would sound like, that my portion is God’s forever. So the instrumental (73) track is in our imagination, what that sounds like. And same thing with (121). Psalm 121 is such a beautiful psalm but we wanted a journey. It’s almost like you have to work at it a little bit and then you’re close enough to the hills that you can lift your eyes. So yeah, it helped us thematically tell a story that felt honest and creative to us. We didn’t try and overthink it too much but a lot of times it felt like there needed more tension. SAM: Musically this album is so amazing. You’ve got such incredible instrumentation and it really brings those psalms and reflections to life. One song in particular, (73) My Portion Forever, it’s very short but it’s got a real danceable groove to it. A lot of rhythm. What can you tell me about that song? SAM: It’s very cool. I’m sure there’ll be a lot of souls dancing around. [Laughs] I’m keen to know, were there any funny moments in the recording of Asaph? ASHER: That song, Dave had originally programmed it and the drums on that were programmed. So watching our drummer try and work out those intricate rhythms that you were just talking about, was funny. It was wild. SAM: In the lead up to this album you released a live EP. Was that to get fans excited for the album’s release? ASHER: Yeah, there was that. I mean strategically we thought we were going to release this album a long time ago, right off the heels of a really good Kickstarter. And now it feels like it’s been so long. So we wanted to reintroduce ourselves to the world after being quiet for so long. That’s what it felt like to me. SAM: Now is there a big idea of key message to Asaph as a whole? ASHER: I feel like it fits into our big message as Loud Harp. We want to communicate God’s peace and hope. That feels very obvious on the first record, but on this one there’s more of a battle going on, because so much of what Asaph writes about is God’s hugeness and his greatness. Like Dave was saying earlier, it feels at odds a little bit with the peace of God. We lived in that tension a little bit on this record. Between those two ideas. SAM: And what’s next for you guys? Are you hoping to record more as Loud Harp? ASHER: Yeah. We are taking it one day at a time, and we’re really excited in this next season to share this music that God has put on our hearts with as many people as possible. We have a lot of great opportunities to join up and lead worship at some awesome conferences and events. So we’ll be travelling and excited about leading people in worship. I’m sure we’ll do some normal venue type of shows where we can play the songs like you hear on the record, but what we’re most excited about in the next six to eight months is just growing together as a band and involving our friends and inviting other friends to help us take these songs on the road, and bless a lot of people, and grow in how we’re able to lead others and worship God. SAM: And is there anything in the pipeline for your other projects? ASHER: Seafinch has been put on the shelf indefinitely. Mostly because where I live, I play music with some other guys. Seafinch was very much just my project. So I’ve started a new project with a couple of other guys. But it’s still so early I won’t even say much more about it. I do have some other stuff in the works. DAVE: I hope to – now that Loud Harp is done – there’s definitely some new songs for A Boy and His Kite that are brewing in me and I’m really excited to think about that. I’ll probably be writing the new record over the next few months but I’m not putting any deadline on myself or anything like that. SAM: Thanks so much for your time to chat about Asaph. It’s been a great insight! Asaph by Loud Harp is out now on iTunes, Amazon, and physical copies are available here. For more music interviews, keep in touch with Reel Gospel on Facebook and Twitter. Posted in MusicTagged A Boy and His Kite, Asaph, christian, Interview, Loud Harp, Psalms, SeafinchBookmark the permalink.